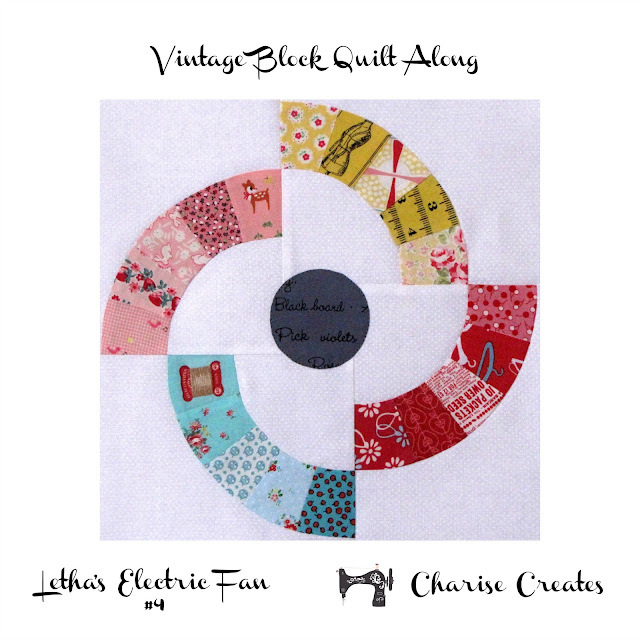 Here you will find block #4 in the Vintage Block Quilt Along! This is one of my favorite depression era blocks right up there with the Rose Dream block! 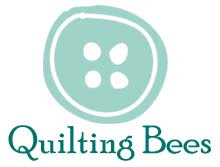 It is made from 4 arcs and 1 appliqued circle. 20 - 3” squares - different prints. 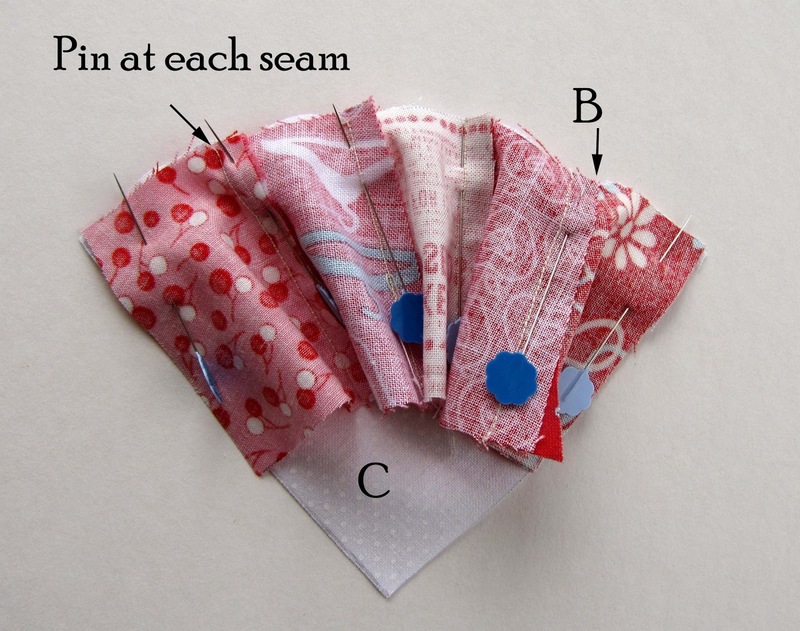 This is also a great project for scraps. 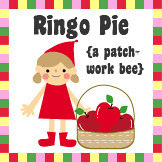 The pieces should be at least ¼” bigger that the individual wedges on Pattern Piece B - Arc. 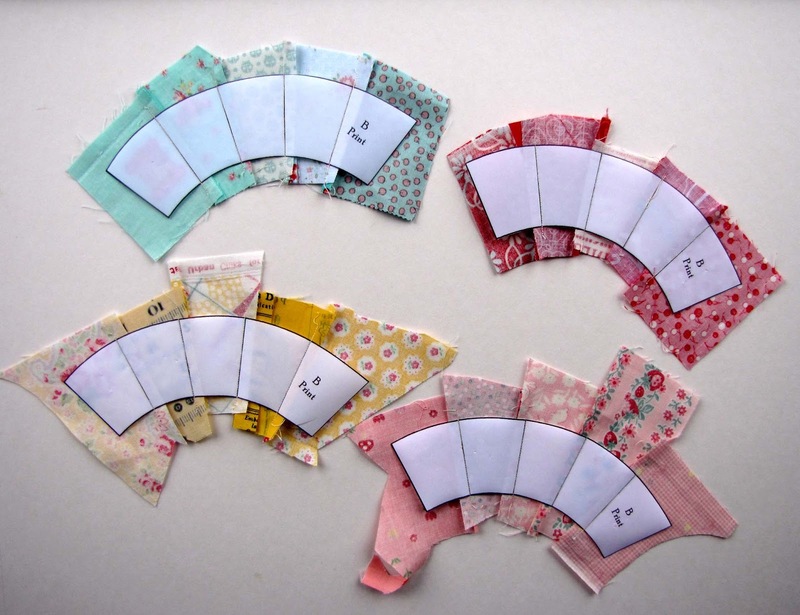 1) Arrange the arcs as the finished block. Pick the fabrics and arrange in a layout to your liking. 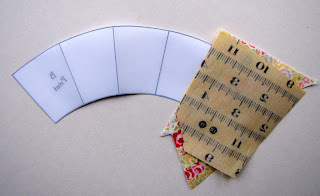 1) Place one of your fabric squares or fabric scraps on the wrong (unprinted side) of the arc making sure to cover the first wedge. The fabric right side will be facing you. 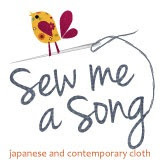 Make sure there is at least ¼” fabric around the perimeter of the wedge. Hold the paper arc up to the light to help positon the fabric. 2) Place the next fabric square right sides together with the first and pin in place. 3) Flip the paper arc over so the printed side is facing you. Stitch on the first line. 4) Finger press the seam. Fold back the paper arc on the next line and trim the second square to 1/4" beyond the line. This is your seam allowance. 5) Continue steps #2 - 5 until the arc is complete. Repeat this process for the other three arcs. 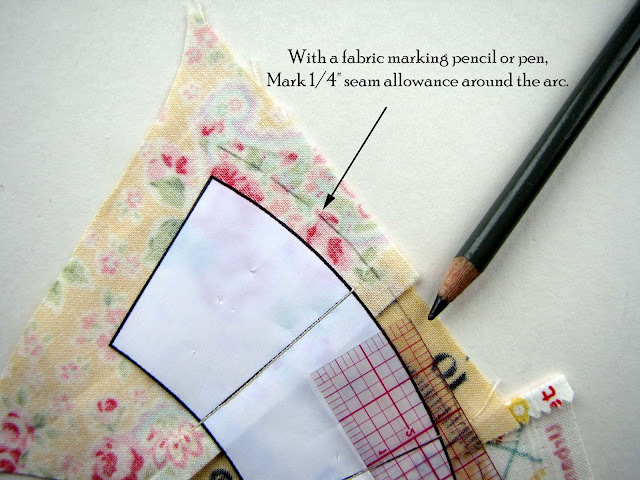 6) Using a water soluble fabric pen or pencil, mark a 1/4" seam allowance around the arc and cut out. Repeat for the remaining three arcs. 1) Place one of your arcs, inside curved edge, to the curved side of piece C, right sides together. Match the notches on C to the seams on the arc. Pin at the seams. Notice how the convex edge, which is bias, is placed on top. 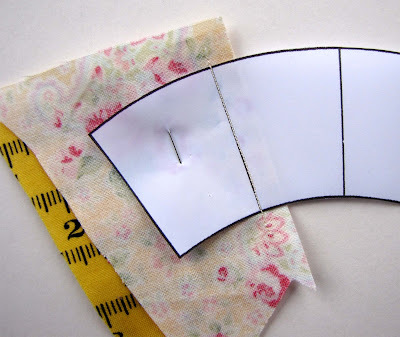 This makes it easier to stitch since you can slightly stretch the edge as your are sewing. Stitch with a 1/4" seam allowance. 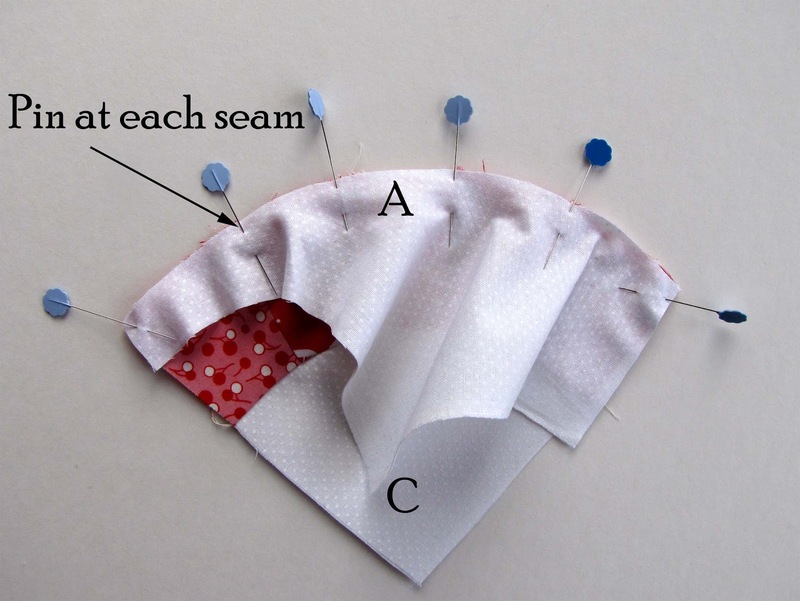 Press the seam toward the arc. 2) Place the curved side of piece A to the outside curved edge of the arc, right sides together. Pin at the seams matching the notches on A to the seams on B. Stitch with a 1/4" seam. 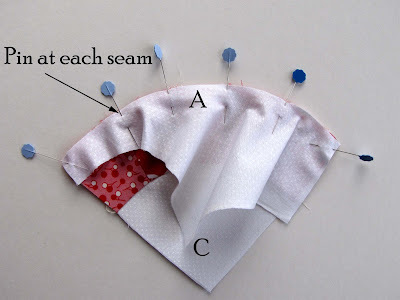 Press the seam towards the arc. Repeat for the other three sections of the block. 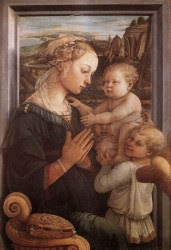 1) Referring to the picture above, place the individual sections as you would like your finished block to look. 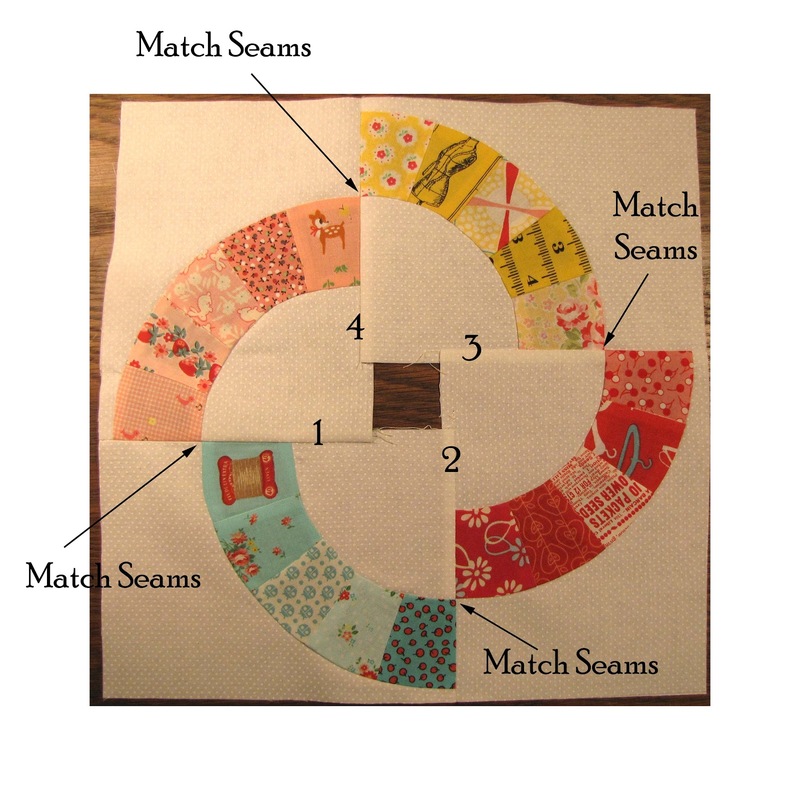 2) Place the top left to the bottom left portion, matching the seams on the arcs as the picture, right sides together. Pin in place. Stitch with a 1/4" stitch. 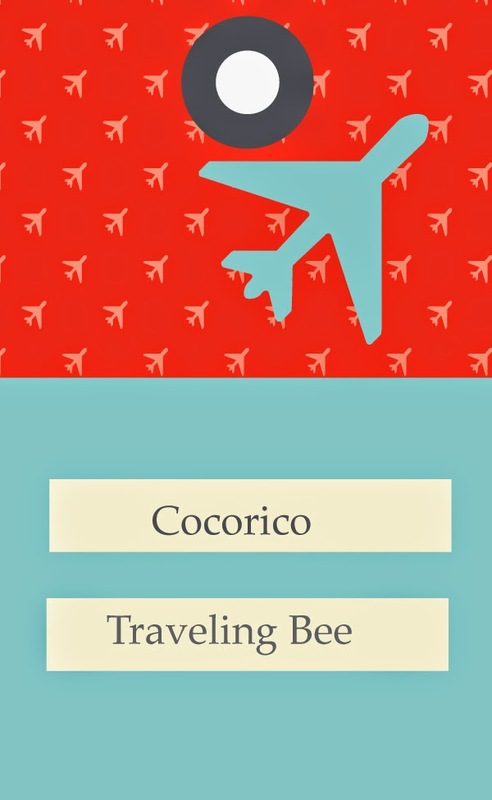 Continue around the block in the order as the picture above. 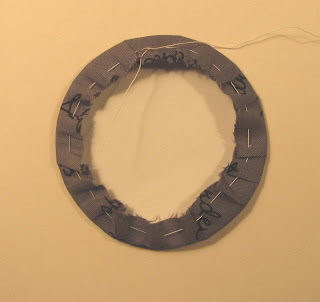 1) Iron the freezer paper circle to the center of the back fabric circle. 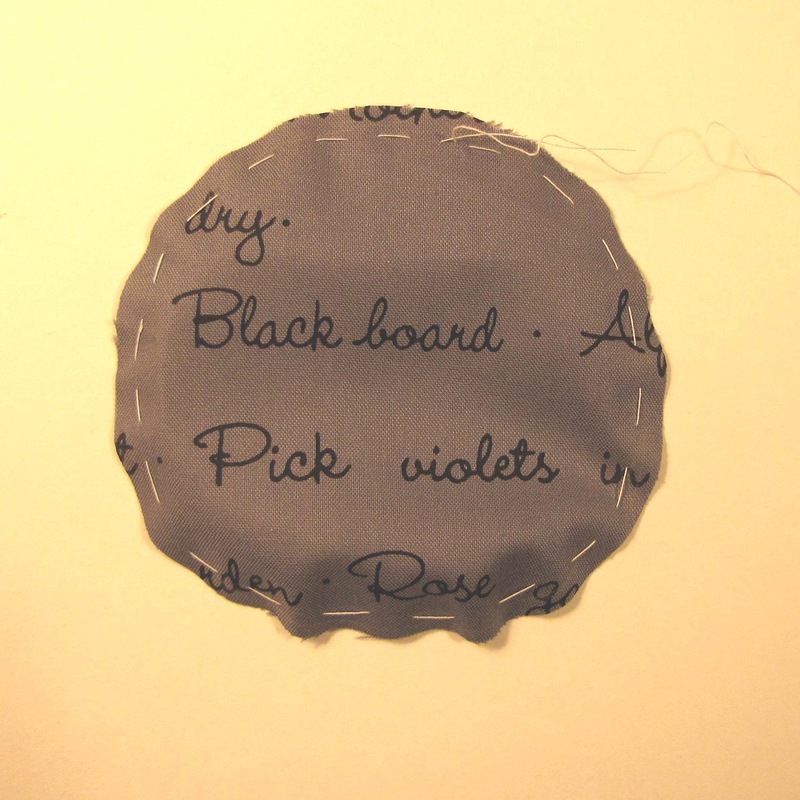 2) Hand stitch a gathering stitch around the perimeter of the circle. 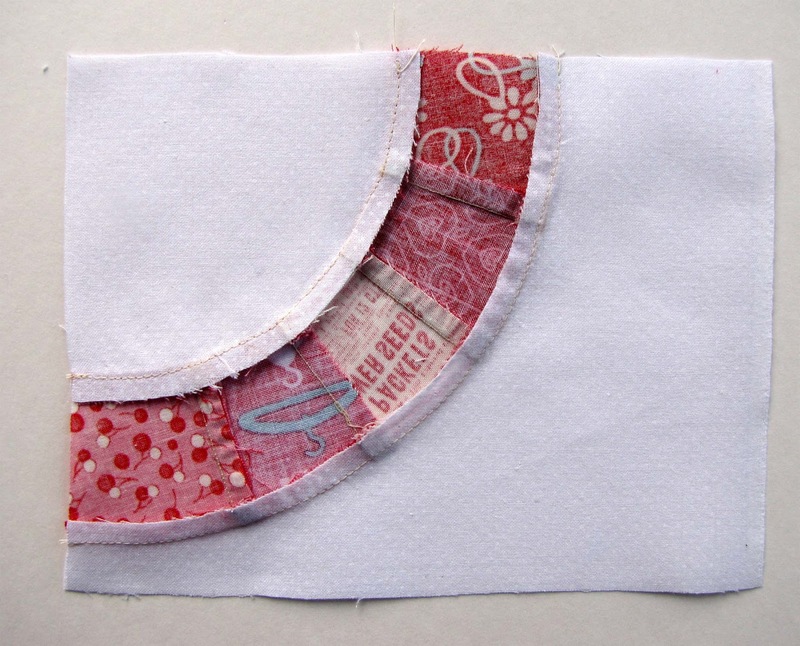 3) Turn the fabric circle over and pull up the gathering stitch. Carefull iron the seam allowance over the edge of the freezer paper circle. 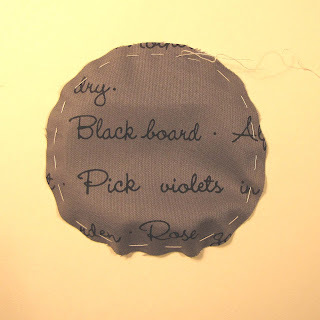 4) Loosen the gathering stitch and remove the freezer paper circle. You should have a perfect circle! 5) Position the circle on the center of the block using the template as a guide. 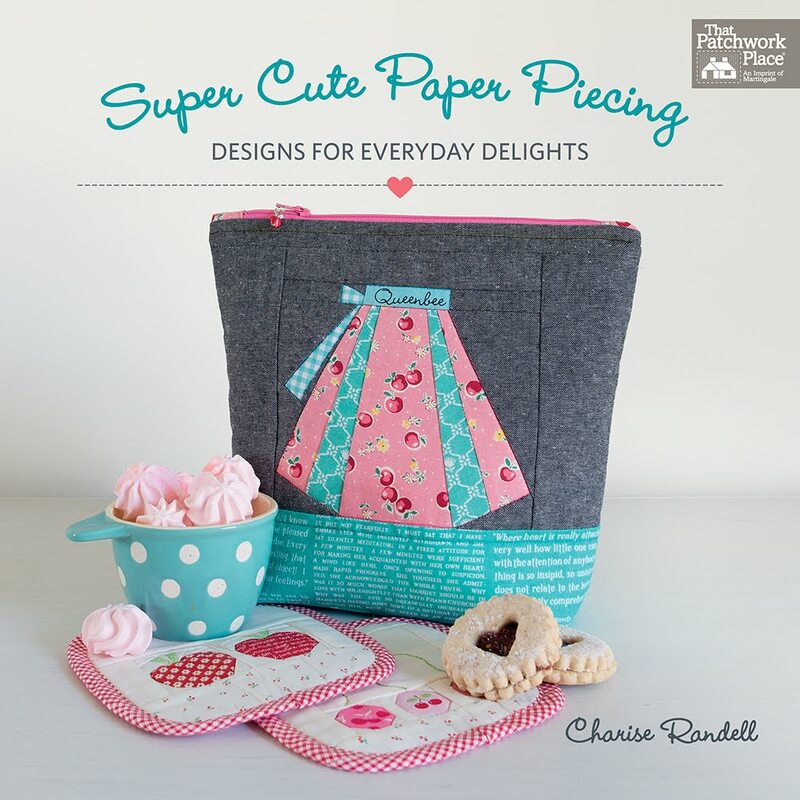 What a cute fan and such a great way to demonstrate paper piecing!! congrats! 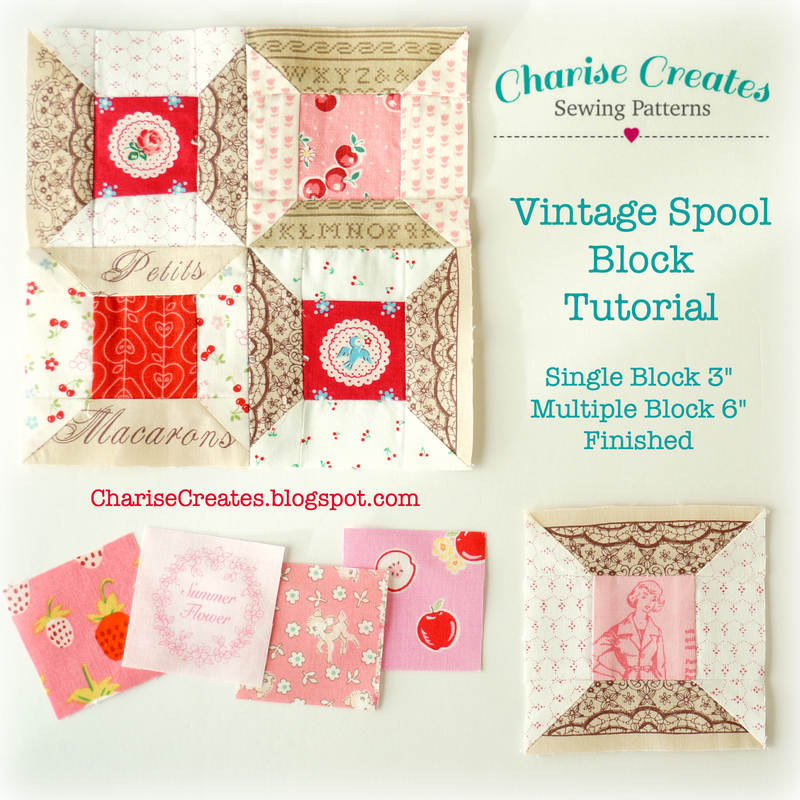 what a 'sweet' block -- i really love vintage! This block is adorable -- it looks so modern, too -- I would have guessed 1950s. 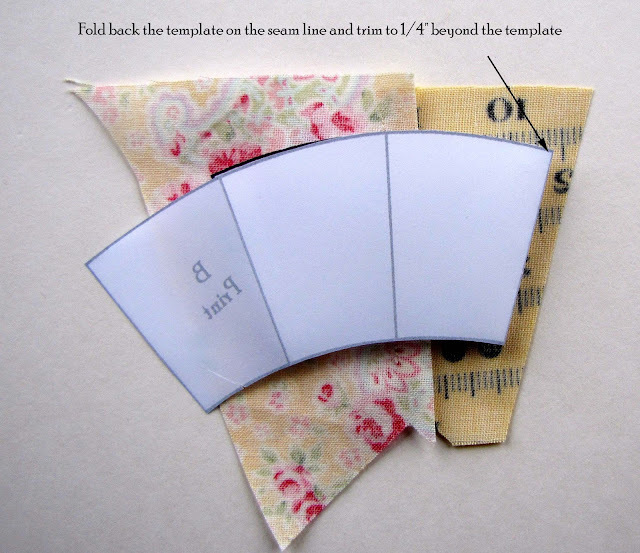 Thanks for the VERY clear paper-piecing tutorial, by the way! Oh this will be fun...okay, I've printed everything out...now to select my "fan blades". Thanks for posting these, they are fun! Oh, that's a very cool block! I haven't seen that one before. It looks like it could be used in so many ways. 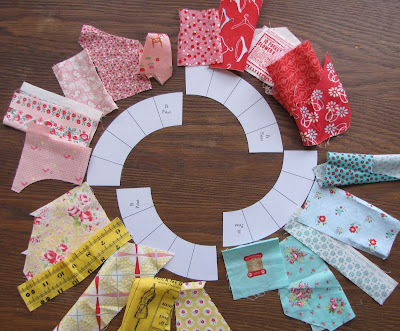 Your appliqued circle is so circular too--hard to do! 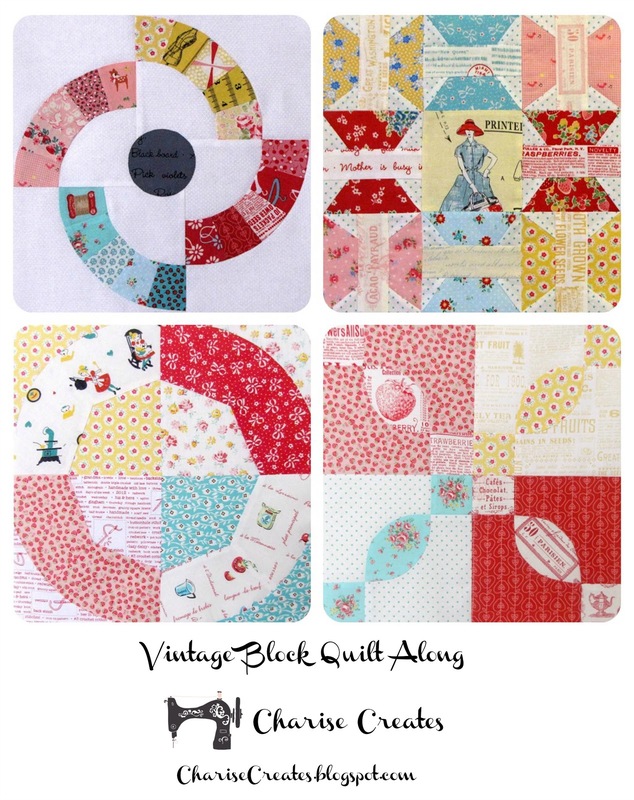 One of my all time favourite vintage blocks- once I am through a little stuff here, I will be feet first into your blocks! Lovely! What an unusual looking block. Maybe created shortly after the time towns were named "Progress?" Thanks for the fabulous instructions too! the circle looks daunting, but with your description, doable. Such a lovely block ~ I've really got to get a move on and do the all blocks. 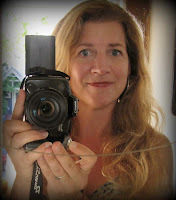 Thanks so much for the tutorial on how to make it! 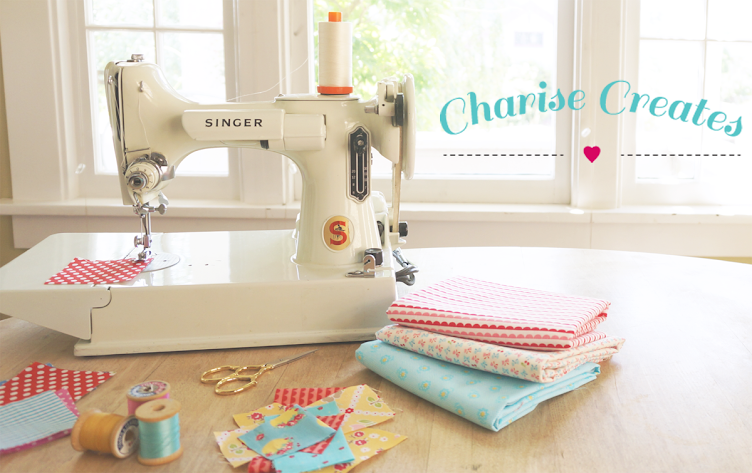 Love this block, Charise. I have a few things to finish and then I am going to play catch up with these blocks. Yay! I've been waiting to see what the new block would be! 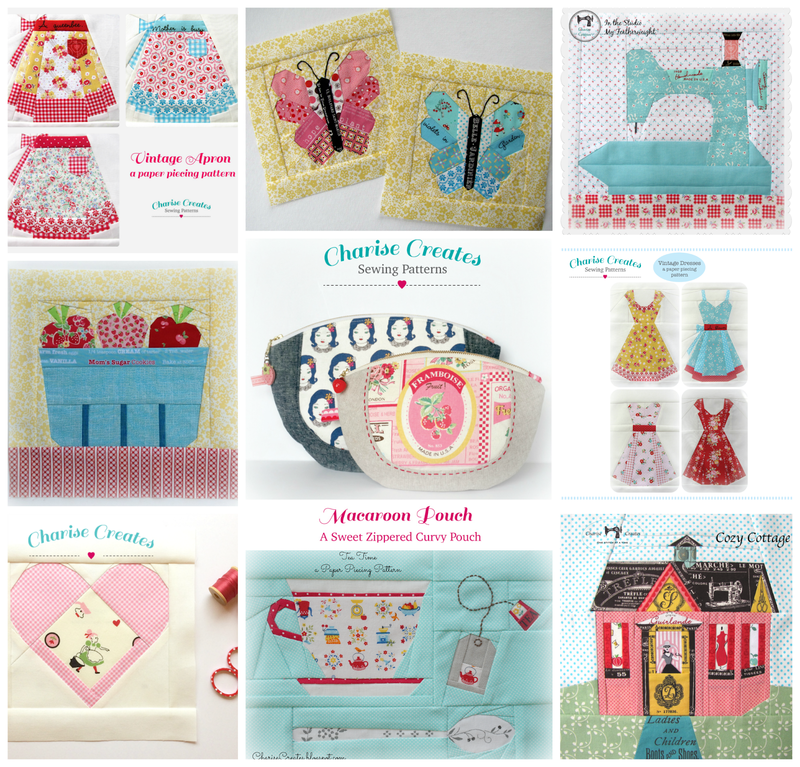 As soon as I finish binding my mom's quilt this week I am going to get started on these beautiful blocks! I am so excited!